CEREMONY DATES AND TIMES Make a note of your ceremony date and time. The Lowry is a 15 minute drive from Manchester City Centre, 30 minute drive from Manchester Airport, and a quarter of a mile from the motorway network. You can travel to The Lowry from both Manchester Piccadilly and Victoria Train Station using the Metrolink tram route. Normally you can board an Eccles line tram and alight at MediaCityUK, a 5 minute walk from the University of Salford MediaCityUK building and the Lowry. From the M60 take junction 12 for the M602. Salford Quays is a quarter of a mile from junction 3 of the M602. Follow the brown Lowry signs. For up to date information please see www.metrolink. co.uk or call Metrolink on 0161 205 2000. Secure parking is available in the Lowry Outlet multistorey car park, which also has designated areas for disabled people on each level. Car parking charges apply at Â£1 per hour for the first four hours, for further details of charges see here. 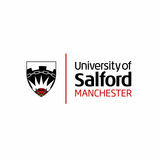 REGISTRATION Upon arrival at Salford Quays, Graduates only should go directly to registration in the University of Salford Building, MediaCityUK, M50 2EQ. Please note, registration takes place in the University of Salford building at MediaCityUK. You must register first before going to the Lowry. It is extremely important that you treat registration as a priority; if you do not register, your name will not be on the presenters list and you will NOT be able to graduate. GRADUATES Follow the map to locate the University of Salford building at MediaCityUK. Please remember, only Graduates are allowed in the registration area.  t the registration desk, you will need your University A ID card and your registration confirmation email.  he staff will provide you with a ticket which will allow T you to collect your gown and enter the theatre. / U pon successful completion of registration you will be issued with your seat number here. At registration you will receive one complimentary copy of the Graduation Souvenir brochure as a keepsake. Additional copies will be on sale priced £3.00 at the Graduation Information desk (in the Lowry Theatre foyer area, ground floor). / Y ou should arrive at registration at least two hours before your ceremony is due to start. The following table illustrates what time you should arrive, dependent on the time of your ceremony. REGISTRATION CLOSES 30 MINUTES PRIOR TO THE START OF YOUR CEREMONY Once registration closes, you will be classed as a ‘late arrival’ and you will NOT be able to Graduate. It is your responsibility to ensure that you arrive at registration at the appropriate time – travel disruptions are highly likely so please ensure that you leave plenty of time to arrive at Salford Quays. This is particularly pertinent if your ceremony is early morning or late afternoon. ROBING Once you have attended Registration at the University of Salford building, MediaCityUK, please make your way back to the Lowry to collect your gowns from the gown makers, Ede & Ravenscroft, situated in the Quays Theatre. PLEASE NOTE: In order to collect your robes, you will need the ticket issued to you at registration and the reference number you received when you ordered your gowns online. Guests are asked to wait in the main foyer for Graduates to return. Please see the plan of the Lowry Theatre on the following page for further instructions. Collect your gowns from the Quays Theatre using the reference number issued to you when you ordered your gowns. Staff from the gown makers, Ede & Ravenscroft will help you with your robing. It is advised that you should wear smart business dress under your robes. Please note that the hood has a loop that is required to be fastened to a shirt or blouse button and pins will not be supplied. Following robing, staff will direct you out of the Quays theatre and into the Quays Theatre bar area, where you can collect your guest tickets and then make your way back down to the main foyer to meet up with your guests. COLLECTING YOUR GUEST TICKETS Guest tickets will be available for collection from the guest ticket desk 2 hours before the ceremony begins. Graduates will need to attend registration and robing prior to collection of the tickets. See the Lowry floor plan on page 8 for the guest ticket desk. Guest tickets will be issued in the name of the student. Therefore, tickets can only be collected by the Graduate upon production of their student ID card. ADDITIONAL TICKETS Additional guest tickets will be available to purchase week commencing 29 April 2019. Please see your confirmation registration email for details of your ceremony time and date. Tickets for the graduation ceremonies are limited and there is no guarantee that any additional tickets will be available for your ceremony. If the University is able to release additional tickets for your ceremony these may be limited to two tickets per person and will be sold on a first-come first-served basis. Please note, if you are able to purchase additional tickets, the invoice that you receive is not your actual ticket. On the day the Graduate will need to collect the ticket(s) from the guest ticket desk, at the Lowry. They can be collected up to 2 hours before the ceremony starts. Where possible complimentary and additional guest tickets will be seated together. A live stream of all ceremonies will be shown in the University’s MediaCityUK building (where registration takes place). This is free of charge; no booking is required. INFORMATION FOR GUESTS PLEASE NOTE: Guests are not allowed in the registration area at University of Salford building, and also the robing areas in the Quays Theatre (The Lowry). Guests should be in their designated seats at least 30 minutes before the ceremony begins and should listen for the Lowry Theatre announcements asking graduates and guests to take their seats. Guests should enter the Lyric Theatre for the ceremony via the door letter indicated on their ticket. Lowry staff will be available to show guests to their seats. PLEASE NOTE: Announcements made by the Lowry Theatre cannot be heard outside of the Lowry building or in the Quays bar area where the guest tickets are situated. We can usually accommodate your needs if we know in advance, but it can be very difficult to re-seat a guest on the day. Please phone 0161 295 2003/5275/5241 to discuss requirements in advance. WHAT TO DO AT THE CEREMONY Graduates should be in their designated seats no less than 45 minutes before the ceremony begins. Please listen for the Lowry Theatre announcements asking graduates and guests to take their seats. Please note that the announcements cannot be heard outside of the building. You will be required to enter the Lyric Theatre via the doors on either side of the main foyer. Please have the ticket issued at registration with your seat number ready to present to the usher who will show you to your seat. IT IS VITAL THAT YOU OCCUPY THE SEAT RESERVED FOR YOU TO ENSURE YOU ARE IN THE CORRECT SEQUENCE AS YOU GO ON STAGE. You are required to leave your seats in rows in order to process across the stage and as such you must have nothing in your hands, apart from your hat or mortar board. We advise that you do not bring any bags or large items but if this is necessary, please ask a guest to look after them for the duration of the ceremony to ensure that all aisles are clear. Under no circumstances must you leave bags under your seats as this may pose a health and safety risk and in some instances, you may not return to your original seat after processing across the stage. PLEASE NOTE: For University of Salford ceremonies, mortar boards are not worn as part of the ceremony. As the ceremony concludes and the audience stands, you should put your hat on for processing out of the Theatre. Graduates will be directed out by the ushers in order of rows, behind the main procession. TAKING YOUR SEAT Please check you are in the correct seat. This will ensure when your name is called you are in line to go on the stage. If this order changes and does not match the official list of graduates, somebody elseâ&#x20AC;&#x2122;s name may be read out instead of yours. Thirty minutes before the ceremony begins, verifiers will check that everyone is sitting in their correct seats. If you are not sitting in your seat by then, your name may not be read out when you go up on stage. OFFICIAL PHOTOGRAPHY The University has appointed Tempest Photography as its official graduation photography service. Staff from Tempest will be identifiable by their yellow scarf or tie. For the ultimate memento of your special day, visit Tempest Photography’s studios for individual and family portraiture, and as ‘Capture the Moment’ on stage shaking hands with the presiding officer (and with no obligation to purchase). The studios will be open throughout the day and we encourage you to pre-book. In the interests of planning your day and to avoid the busiest period (immediately after your ceremony) we also highly recommend visiting the studio before your ceremony. PLEASE NOTE: the University cannot be held responsible for photographs taken by any other companies who might operate in the area. Please be aware of possible rival photography suppliers that operate in the Lowry Outlet Mall. HELP AVAILABLE ON THE DAY Should you require any assistance, please approach the Graduation Information Desk or any member of University staff wearing a badge displaying the University logo and their name. Lowry staff wearing red T-shirts and the Lowry logo will also be on hand to assist with your queries. Tempest Photography staff wearing a sky blue scarf or tie will be on hand to answer any questions about your official photography. 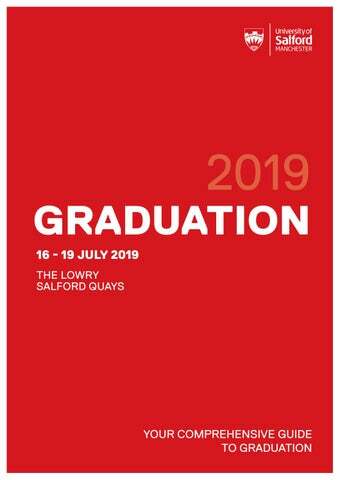 PLEASE NOTE: The Graduation Office will be closed from Monday 15 – Friday 19 July as all staff will be located at The University of Salford Building at MediaCityUK and The Lowry. In the event of a problem, please call the University on 0161 295 5000 and a message will be passed to Graduation staff at The Lowry.